I can say I’m adventurous. Not the majorly adrenaline junkie type but more of the girl who loves trying out new things and intensely in-love with the idea of wandering. 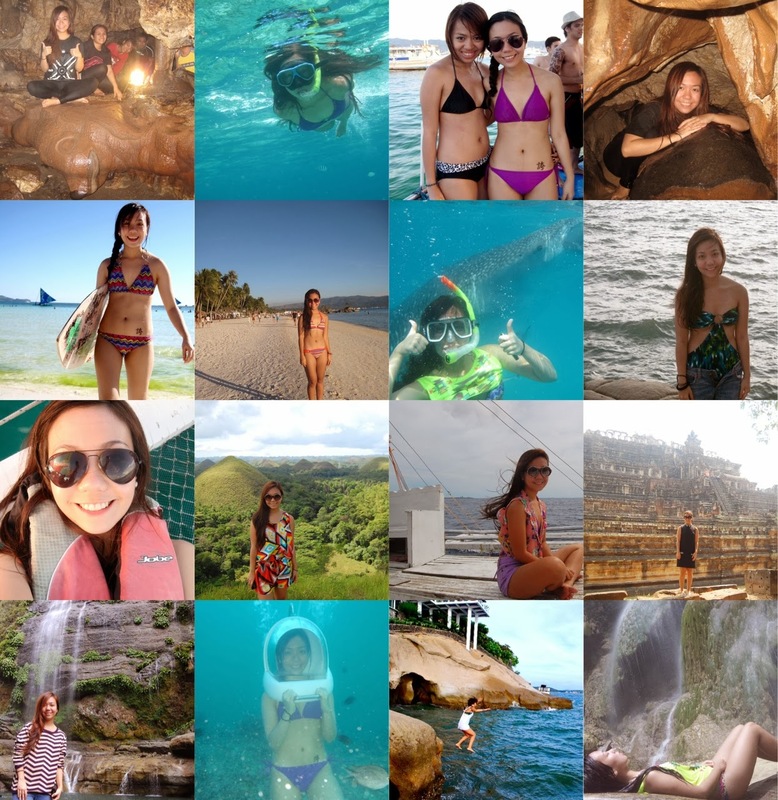 If you’ve been a loyal reader of this blog, you’d know how much I love traveling. I post at least one travel diary a month. I can’t function properly at work if I don’t get out of town/country at least once every three months. I work hard because I want to constantly travel. I love my job now in the fashion industry but I’ll definitely trade it if I get a job that will require me to become a jetsetter (hihi). With my very active lifestyle, it’s funny how super extremes yun ginagawa ko in life. Because with what I do for a living, I always have to look great. Clothes wise and face wise of course. I have to look presentable all the time. But when it comes to traveling, I wear zero makeup. Especially most of my adventures involve the sea (yes, I’m a beach baby!) so I don’t bother covering my imperfections at all. 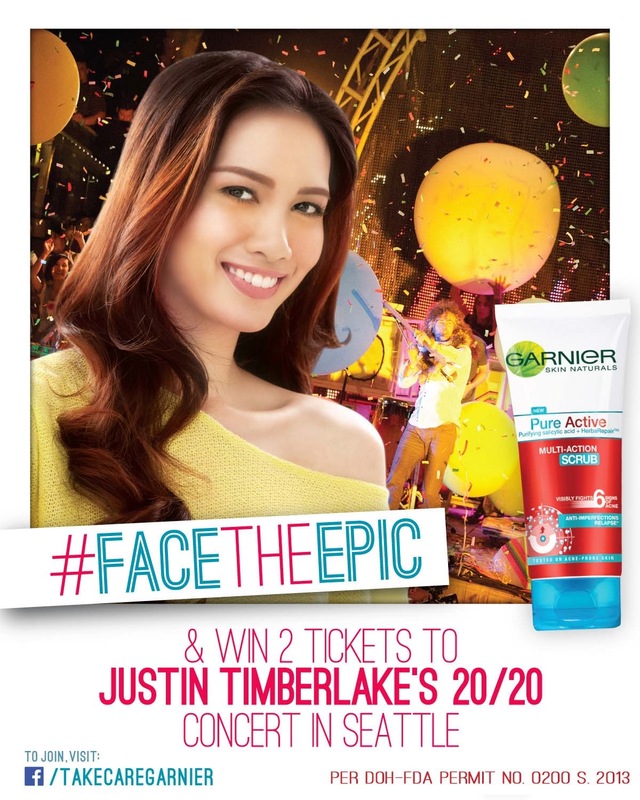 But actually, this may seem overly confident (hahaha) but I rarely get pimples. People ask me how I take care of my skin. I don’t go to the derma also because I had bad experiences with those :P Of course my best advice is to not wear make-up all the time. Ako once in a blue moon lang mag-makeup. Eventhough I want to, I don’t know how to beautify myself :P So au naturel ang peg ko all the time! Haha! Lately, I discovered about the Garnier Pure Active Range and decided to give it a try. 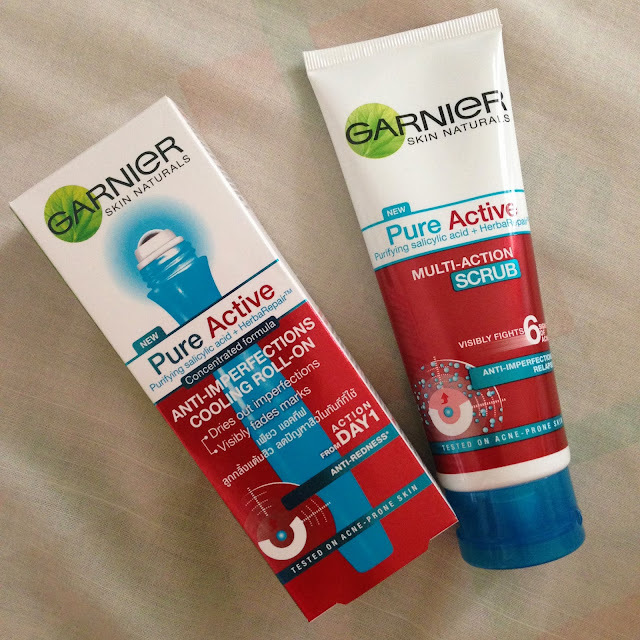 The Pure Active line is specifically made to actively fight skin problems. I tried the multi-action scrub. It has purifying salicylic acid and HerbaRepair™ that actively fights pimples, whiteheads, oiliness, enlarged pores, and unevenness. Since I don’t like putting stuff on my face, I feel like this scrub is enough. But I found out it’s best to use it with the Pure Active Toner because the skin imperfections will be reduced, pores will be tightened, skin will be visibly smooth and oiliness will be minimized. For my pimples, I use the Pimple Roll On which dries pimples immediately with its cooling roll-on containing the maximum strength salicylic acid concentration allowed for the mass market. Some kasi are too harsh for your skin (I actually tried pimple creams before that created red spots in my face kasi strong mashado yung chemicals used). Speaking of Garnier and traveling, guess what? 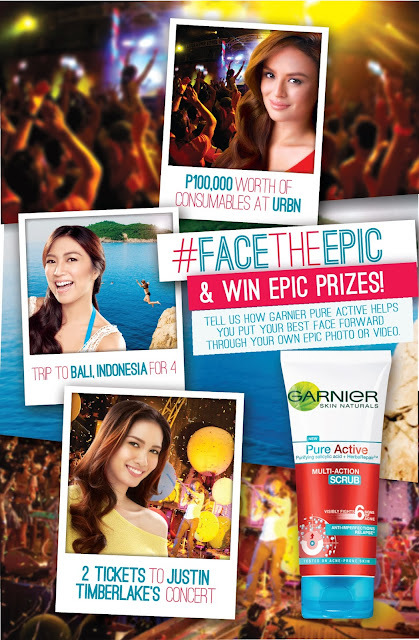 J You can win trips to Bali, Justin Timberlake concert in Seattle or 100,000 worth consumables at URBN bar and resto just by joining their contest! 1. Contestants must be at least 18 years old to qualify. 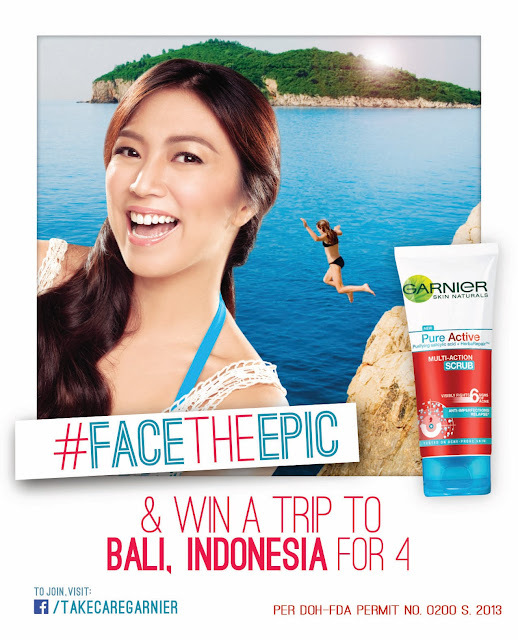 · To qualify, Instagram users must post their photo/video and hastag #FacetheEpic. · Inclusive of round trip flight tickets, accommodations and P20,000 pocket money. · Winners should secure their own passport and VISA. · Inclusive of round trip flight tickets, accommodations, and P10,000 pocket money. 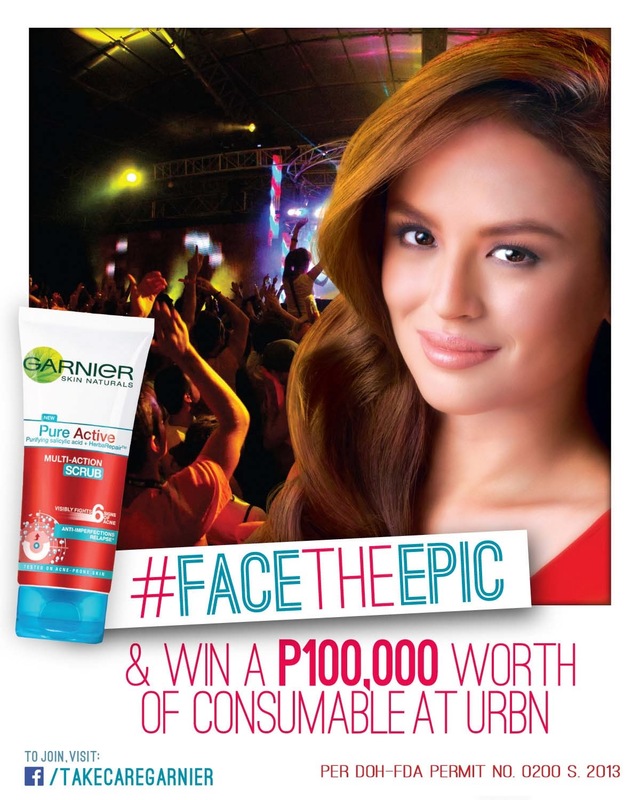 c. P100,000 worth of consumables at URBN. Consumer Advisory Hotline at (02) 672-7272 or consumer.care@ph.loreal.com. 6. Promo Period is from October 25, 2013 to December 31, 2013.
im so jelly with your lifestyle Trace! Its truly epic!